An amino acid, NAC has been shown in clinical studies to be an excellent means to recharge cellular glutathione, a foundational antioxidant. 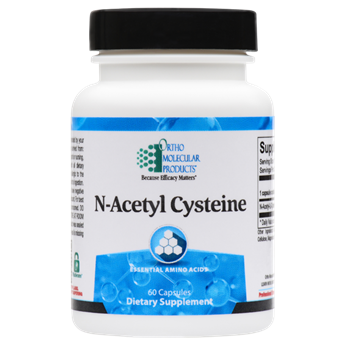 N-acetyl cysteine (NAC) is an amino acid that boosts antioxidant function and is a source of the conditionally essential amino acid L-cysteine. It has also been found to raise glutathione levels. Glutathione is an important antioxidant used in many different metabolic processes within the body. Maintaining adequate levels is important to maintaining the health of the respiratory, hepatic, and immune systems. It is also important in supporting antioxidant protection of lipids and proteins and supporting the normal response to inflammation. NAC is commonly used as an agent to help clear sinus and airway congestion caused by mucus overproduction. It also supports antioxidant and cellular detoxification pathways in the body. Each capsule of the N-Acetyl Cysteine formulation includes 500 mg of this versatile amino acid.